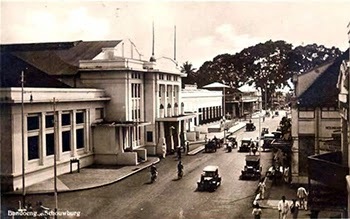 In 1895, for his first major building constructed in the city of Bandung. Located center of town, the building! Now called Gedung Merdeka. At that time, the building was just a simple building used as a place of recreation for persons of Europe in London. Every weekend or a holiday, his usual stretching plantation owners in various mountains in West Java, trooped “down the mountain” for a vacation. At night, staged various art performances, dinner, and its other entertainment. This building is among the most luxurious in comparison to his other buildings in the city of Bandung. Her early this building is named Sociteit concordia (CS). Then renovated in 1920 and 1928, thus becoming the building in its current form. Construction of the building last used the services of two Dutch architect, Van Gallen last and CPWolf Schoemaker. Both are great teachers Techniscehe Hoogeschool (ITB), who once lectured building art and architectural history at the president Sukarno when he was a student. Concordia building is very grand building. The floor was made of Italian marble. The room place to drinks and relax is made of wood cikenhout. While the lamp is used for lighting – decorative lights glittering crystals. In the east wing of the museum there are Asian-African conference, the theater also AACC (Asian-African Culture Centre) the entire land area of ​​7,500 square meters of his reach. 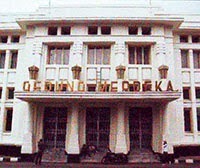 After Indonesian independence, the building was taken over by government and renamed to Merdeka Building, by president Sukarno. This name lasted replacement ahead of its Asian-African Conference (KAA) in Bandung in 1955.